Artificial turf offers many benefits. One of them is durability. It withstands harsh weather much better than natural grass. That said, some people still fall prey to the myth that frost can damage artificial turf. They believe that walking on artificial turf with a layer of frost over it will damage the blades. This simply isn’t the case. 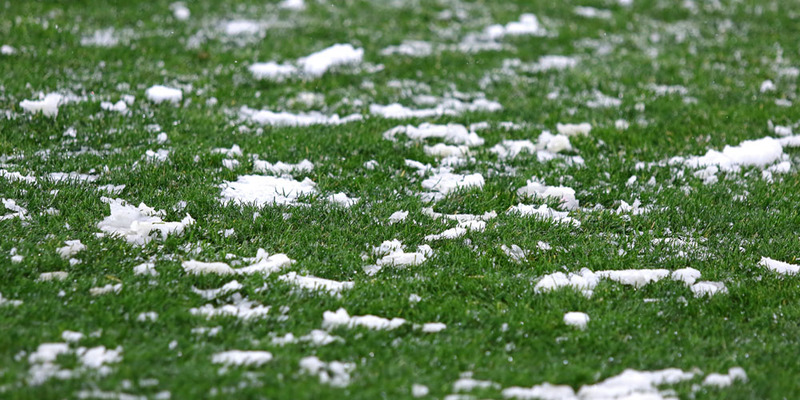 Our experts at Watersavers Turf will be happy to explain why our products stand up to this common winter lawn issue. Walking on frost-covered synthetic grass won’t damage the blades on its own. Still, it’s not a good idea. That’s because walking over the frost compacts it. This can create a thick a layer of ice. Many people try to remove this layer with a shovel or by hand. Improperly doing so may damage your synthetic grass. If you don’t remove the layer, walking on the grass may be unsafe. The odds of slipping and falling also become greater. To keep your synthetic grass in the best shape possible, your best bet is to let the frost melt before using your lawn. Letting frost melt on your plastic lawn is the best option for a lot of reasons. Again, compacting it into an ice layer could result in damage if you try to remove it. On top of that, plastic lawns have porous backings. When frost melts on a live lawn, it could make the grass muddy and soggy. With a plastic lawn, the water will simply drain into the soil beneath it. Of course, you might be in a rush to use your lawn. This may be the case if you own a commercial property. Telling guests to stay off the lawn until the frost melts isn’t always feasible. In these instances, you can help speed up the process by pouring warm water over the turf. If you have some old blankets you’re not using, covering the lawn with them will also help warm it up. These simple steps will ensure your frost melts more quickly than it would on its own. Don’t use salt to speed up the melting process. It won’t damage the blades, but it could damage the backing. Frost forms on fake grass when the turf becomes colder than the air surrounding it. Frost usually happens overnight and is more common on clear nights. You can prevent this by monitoring the weather reports during the cold winter months. If the report indicates that frost is expected overnight, lay out a tarp over your fake grass. The tarp should collect the frost. Then all you have to do is lift it off your fake grass the next morning. There are many artificial grass benefits that live grass simply doesn’t offer. This is very clear during the winter months. One of the benefits of artificial grass is its ability to stay in good shape despite harsh weather conditions. A natural lawn is frozen when a layer of frost covers it. This means walking on the blades could snap them in half. This doesn’t happen with faux turf. That’s why artificial grass benefits anyone who wants to keep their lawn in great shape during the colder months. Frost and snow can also alter the color or general appearance of a natural lawn. Most property owners want their lawns to stay green and vibrant all the time. Fake turf’s color durability is a benefit that is particularly appealing to business owners. Bright-looking lawns attract guests. They boost the curb appeal of businesses and stand out to passersby. A lawn that’s been discolored due to winter weather won’t have the same effect. Neither will a lawn that’s soggy and muddy. Unfortunately, lawns often become messy when frost melts. This renders them essentially unusable until they dry out. Thanks to superior drainage, fake turf dries out much more quickly than natural grass. Real grass simply isn’t ideal for all-season use. Faux grass is a unique surface material because you can enjoy it throughout the year. To learn more, visit one of Watersavers Turf’s SF Bay Area locations. Our team will explain how our products can stand up to the harshest of weather conditions. Call us toll-free at 844-974-8873 if you don’t expect to be in our area soon. We also deliver throughout the Continental United States. So, people from across the country can benefit from our products. We’re also happy to chat online. Make sure you ask about our free large 1’ x 1’ turf samples! They’ll help you choose the ideal turf for all seasons.